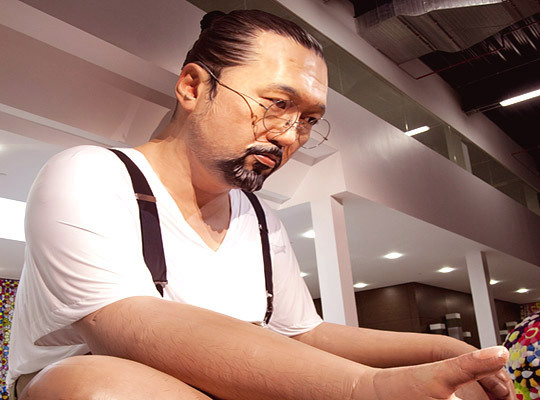 A giant, blow up self-portrait sculpture of Takashi Murakami adorns the foyer of Doha’s Al Riwaq Exhibition Hall. Seated in a Buddha pose, the artist’s right hand is upturned in the abhayamudra gesture of reassurance, Murakami offering his blessing for a safe passage through the visual roller-coaster that awaits. Once inside the aptly titled Murakami – Ego retrospective, the visitor is required to willingly surrender himself to the artist’s trippy world of kawaii characters and blazingly coloured manga landscapes. A large four-panelled panorama featuring the oval shaped head of Tan Tan Bo Puking aka Gero Tan (2002) decorates the whitewashed walls, his undulating tongue dripping with psychedelic lava, while in the centre of the room we are introduced to DOB – one of Murakami’s many recurrent personalities – striking a Minnie Mouse pose amid a “strange forest” of mushrooms. Any survey of Murakami, who was born in 1962 and has a PhD in Nihonga painting (traditional Japanese painting) from Tokyo University of the Arts, demands a full introduction to his recurring personages. Kai Kai and Kiki are favourites and are set against a backdrop of Kai Kai Kiki land on the “superflat” canvases for which the artist is best known. Murakami coined that term to describe post-war Japanese culture and society, as well as the aesthetic characteristics of creative tradition and, indeed, to label his own artistic style. In the next gallery is The 500 Arhats (2012), a 100 metre-long painting specially commissioned for this retrospective. Based on the 2011 tsunami, it takes the works of the little-known 19th-century Japanese painter Kano Kazunobu as a departure point and imagines an apocalyptic landscape of spectacular colours, with the five hundred arhats (monks) lined up at its foot. As a tale of destruction and chaos unfolds on the left, large duotone paintings of dragons hang on the right and Murakami’s characters loom from all angles, lit up in the darkness around the large, inviting tent at the gallery’s centre. This cosy recess provides a den for watching the adventures of Kai Kai and Kiki as they tumble through happy lands (with the occasional flash into a dark world of despair). The exhibition finishes where we started, with Murakami appearing in a series of self-portraits, where you begin to develop the sense that he has abandoned our world for his own. 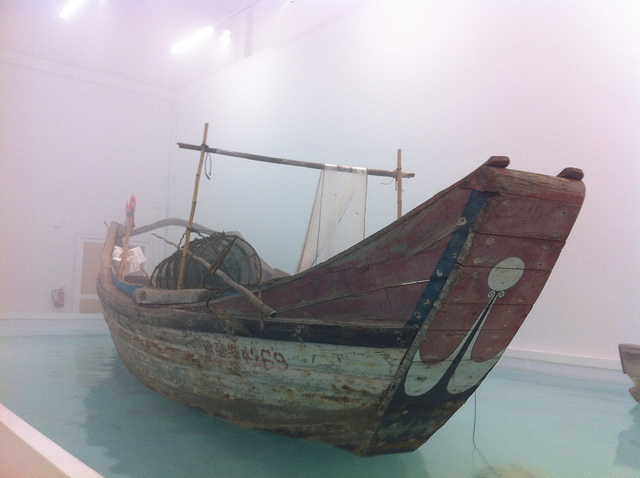 Across town at Mathaf, a museum committed to presenting an Arab perspective on modern and contemporary art, Cai Guo-Qiang’s Saraab exhibition (Arabic for mirage), closed last weekend after a lengthy run. Consisting largely of works linking Chinese and Arabic culture, the exhibition was created in collaboration with 200 Qatari volunteers. The links between the two cultures may seem tenuous, but Guo-Qiang’s installations repeatedly set this misconception straight. Homecoming (2011) presented a lyrical positioning of large boulders shipped from his home city of Quanzhou, the starting point of the maritime Silk Road, while the writings engraved on the stones were duplicated from graves of Muslims who passed through the city centuries ago. Saraab examined a complex web of conceptual and material connections between China and the Arab world, of dynamics between historic localities marked as much by the passage of ideas as by material trade. Each work tied itself to Middle Eastern themes, such as miniature Islamic paintings, the embroidery of abayas, calligraphy and geometric patterns. Cai Guo-Qiang also explored the fragility of intercultural connections through a life-size artificial camel suspended from the ceiling and surrounded by falcons in Flying Together (2011). It was unclear whether the birds were attacking, aiding or merely indifferent to the dromedary. Still, one is compelled to question and analyse the dynamics of this implausible circumstance. The final piece, 99 Horses (2011), considered both the animal and the number 99 as unique emblems in both the Chinese and Muslim worlds. In Chinese culture, 99 is the key to infinity, while in Islam there are 99 names for God. Capturing the shadow of a frieze of gold-leafed model horses running towards a dark explosion, the image is reminiscent of a cave painting – time may breed diversity and cultural idiosyncrasies, yet we are all rooted in the same ancestry. From the light and airy Mathaf galleries, it is a short trip to the more subdued Louise Bourgeois: Conscious and Unconscious exhibition in Katara Heritage Village, which ended its own run yesterday. The symbol of the spider holds a cultural resonance within the region and an honoured position in Islamic tradition. The Quran includes a chapter entitled The Spider and children are taught that it is forbidden to kill one, an attitude directly linked to a story of the Prophet Mohammed, whereupon a spider protected the Prophet from a band of assassins by weaving her silk web over the entrance to his hiding cave. Bourgeois’ mother was a tapestry repairer, a powerful role model for her daughter; she nevertheless tolerated a visible affair between Bourgeois’ father and her governess, a self-described childhood “trauma” that Bourgeois revisited in her artwork throughout her life. While her philandering father wanted Louise to marry and continue working in the family business, Bourgeois resented his control over her and after her mother’s death escaped to New York. Her deep psychological wounds fed into her artistic practice. 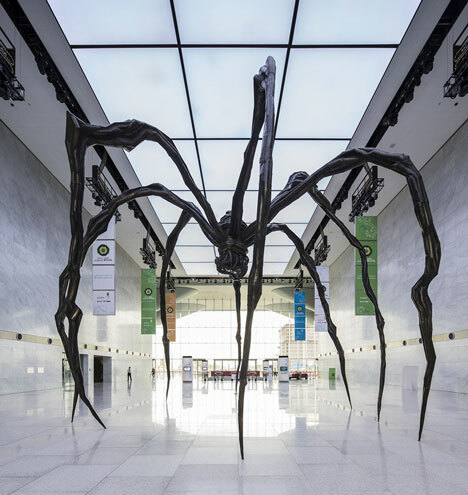 Bourgeois’ work may seem inaccessible to the untrained eye, its imagery rooted so tightly to an individual psychology, yet, to support the installation of Maman with such an exhibition underscores Qatar’s commitment to art’s life-enriching quality. Sheikha Al Mayassa bint Hamad bin Khalifa Al Thani, chair of the Board of Trustees for the Qatar Museum Authority, notes in the exhibition’s catalogue that “lives are changed – whether forever or even just for a moment” and this natural attitude to art is reflected in the citywide placement of the artworks and museums, allowing for casual encounters in a place where the cultural lure is growing stronger with each passing season.